Across the ancient Mediterranean world, Egypt was renown for its magical and medical lore. Scholars traveled from afar to visit its unparalleled libraries, study its age-­old texts, and learn the wisdom of its priestly scholars. The categories we label as magical or medical were not nearly as distinct in Egypt as we believe them to be in the modern world today, but they existed on a continuum concerning treatment of ailments attributed to a mixture of physical and spiritual causes. 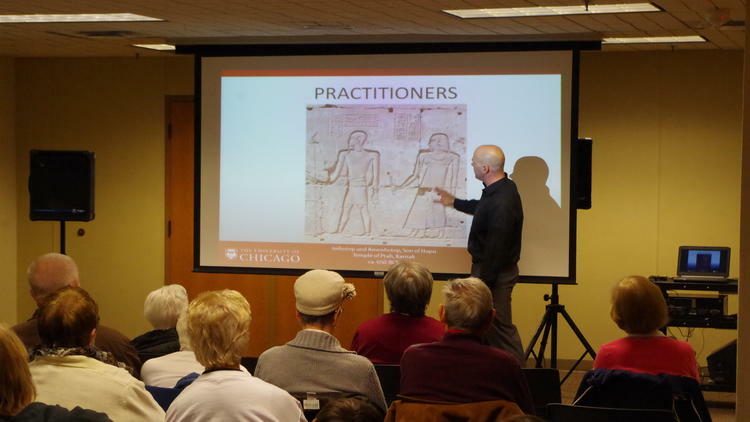 This talk will discuss how the ancient Egyptians viewed these categories by surveying the surviving evidence for the practice of magic and medicine. The evidence reveals a complex, nuanced, and sophisticated approach to patient care carried out by knowledgeable practitioners who understood such things as the workings of the circulatory system and the pulse long before this knowledge was attributed to Hippocrates. In what may be surprising to our current conceptions, it turns out that the same scholar-­priests were responsible for the professional work of both magician and doctor. This talk was given on Tuesday, January 17, 2017, at the Bartlett Public Library. It was covered by Roslyn Summerville for the Chicago Tribune.